The DRA-ACT-4I AND DRA-ACT-4V Series are isolated 4-wire ac current and ac voltage input DIN rail mount signal conditioners that convert the measured input into a proportional, linear and highly accurate 4-20 mA output current. 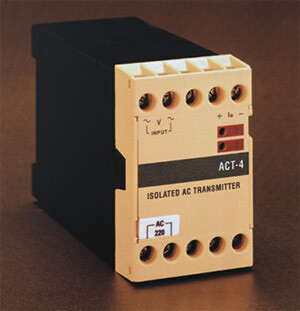 The DRA-ACT-4I Series of ac current input models includes models for 0-1 Aac and 0-5 Aac inputs with a 4-20 mA output. The DRA-ACT-4V Series of ac voltage input models includes models for 0-150 Vac, 0-250 Vac and 0-400 Vac inputs again with a 4-20 mA output. Standard instrument power is 115 Vac, 50/60 Hz. Units can also be configured for optional 230 Vac, 50/60 Hz power. For complete safety, an internal transformer isolates the signal conditioner input from the output thus enabling these units to withstand large momentary inputs. Complete input to output isolation, high surge current capacity and high output signal-to-noise ratio make these signal conditioners highly immune to ground loop signals and RFI. Zero and span trimmers accessible from the front panel of these units facilitate fine tuning. 참고: * Standard power is 115 Vac, 50/60 Hz. To order unit configured for 230 Vac, 50/60 Hz power, add suffix “-230” to model no., no additional charge. Comes with complete operators manual.